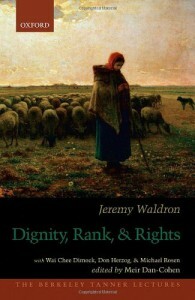 This book will best serve those who have a bit of background (and interest) in the dignity debate, and who favors more 'casual' styles. That said,this book is sufficiently charming to be read by those who don't care for dignity or lectures (for the former, a careful reading of this book will probably make them care about it at least some). Prof. Waldron is the best kind of liberal that currently exists, and the comment and response format allows the readers a glimpse into how people actually 'debate' these issues in a constructive way - a treat for those of us not dignified enough to belong in the ivory tower.